In a disaster, governmental, non-profit and faith-based organizations must respond to the needs of a diverse population. It’s an essential that those who seek to help those in need know how to care for minority religious groups. CRCC managing director Brie Loskota (far right) participates in a signing ceremony at the American Red Cross Disaster Operations Center. To respond to this need, the National Disaster Interfaiths Network (NDIN) and the USC Center for Religion and Civic Culture jointly produced the “Religious Competency in Mass Care” tip-sheet set. 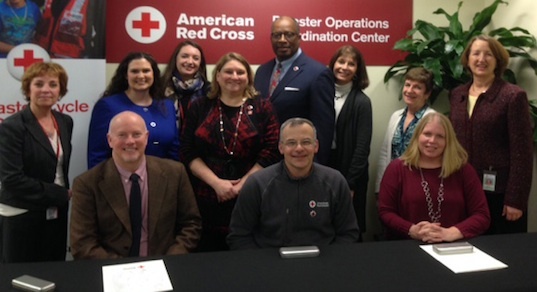 The American Red Cross signed a collaboration agreement to co-brand the tip sheets on December 9, 2014. This tool for disaster relief providers offers governmental, non-profit and faith-based organizations facts and guidance for specifically addressing the mass care needs of minority faith communities. Mass care needs include but are not limited to appropriate food, medical care, and emotional and spiritual care in shelters or other assistance centers following a disaster. The American Red Cross leads mass care efforts across the United States and aims to meet the religious needs of all Americans. By co-branding and these mass care tip sheets, the American Red Cross is demonstrating its commitment to excellence and ensuring these resources are utilized by its staff and volunteers—as well as helping to reach a wider audience through its many partners. 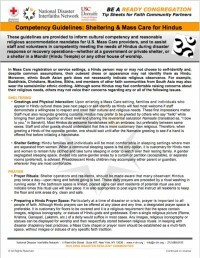 Within each tip sheet are guidelines that inform providers on the unique mass care needs of five major minority faith communities—Buddhist, Hindu, Jewish, Muslim and Sikh.